Emily Rose Denny grew up searching for her parents' approval. As a college graduate attempting to build her resume, she recognizes that she's still seeking to measure up to her parents' standards. Success, no matter the cost, is her goal. She's not ruthless, just very determined. She takes joy in her temporary job in Callahan Crossing as she works to set up the town's new museum. She also enjoys the people of the city, especially one handsome cowboy, Chance Callahan, maybe a little too much. Chance appreciates spending time with Emily too. In fact, within a few times of meeting her, he knows he's going to marry her. Unfortunately for him, Emily plans to leave for the big city in a few months and really isn't interested in having a pointless relationship. Will Chance be able to convince Emily to stay? Will Emily learn that true contentment is found in love rather than in a misplaced obsession with success? 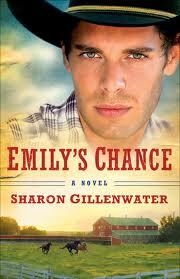 Emily's Chance by Sharon Gillenwater is a sweet love story. There are a lot of feel good moments in this book. However, the story didn't captivate me. I think it would have benefited the story if the main characters had not been quite so perfect and if there had been more tension. If you like romance novels with predictable and fairly perfect characters, you will probably like this book. However, I recommend renting it from the library before buying.